The 1st all-in-one Micellar Cleansing Water that purifies and removes make-up in 1 gesture. Enriched with Micelles, it captures and lifts away residue from face, eyes & lips like a magnet. No need to rub to get of impurities & makeup. The refreshing formula is non-sticky, non-oily and without perfume; it is suitable for all skin types including sensitive skin. Result: Skin is perfectly clean, soft and looks healthy. Directions: Apply onto face, eyes and lips with some cotton pads without rubbing. No rinsing required. All-in-1 Cleanser & Makeup Remover. Cleanses + removes makeup + refreshes skin. No rinse, no harsh rubbing. Ideal for face, lips, and eyes. Explore the entire range of Makeup Remover available on Nykaa. 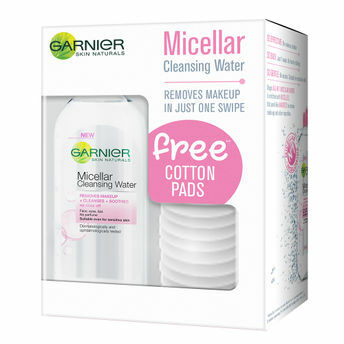 Shop more Garnier products here.You can browse through the complete world of Garnier Makeup Remover .